"The U.S. construction industry needed a competitively priced epoxy primer with a longer recoating window since it could be months or even a year before the steel is needed"
PITTSBURGH--(BUSINESS WIRE)--PPG (NYSE: PPG) today announced the introduction of PPG SIGMAFAST™ 278 epoxy primer to the U.S. market, giving fabricators much-needed flexibility when recoating steel components due to a longer re-coating window and reduced emissions. Structural steel for large-scale construction projects is typically coated with primer at the fabrication facility and stored until needed, at which time the topcoat is applied. With traditional epoxy primers, fabricators have to apply a topcoat within a few weeks of a first application or plan and budget for additional surface preparation later on. Another key advantage of PPG Sigmafast 278 coating is its composition of 80 percent solids and 20 percent solvents, which translates into low emissions of volatile organic compounds (VOCs). While some U.S. fabricators are forced to shut down their coating operations once they reach their permitted VOC emissions cap, PPG Sigmafast 278 epoxy primer can allow them to coat more product in a set time due to its lower emissions profile. 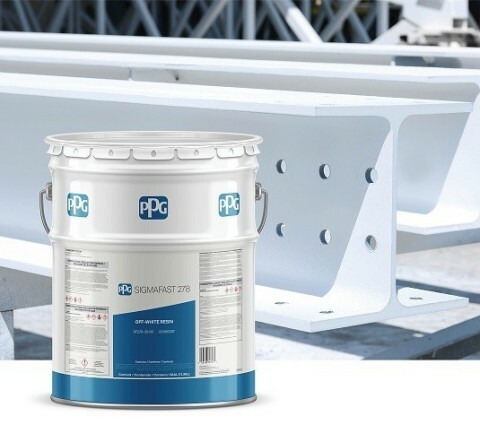 PPG Sigmafast 278 coating has been available in Europe and other regions for several years. Its availability in the U.S. market means that global customers can now specify the same primer at their facilities around the world. Broad application thickness range to enable high dry-film thickness in one coat. For more information on PPG’s protective and marine coatings, visit www.ppgpmc.com . SIGMAFAST is a trademark of PPG Coatings Nederland B.V.